Traveling with a bicycle has never been easier for bicycle dealers and their customers. Crate works bicycle transport systems offer simple, hassle-free, dependable bicycle cases that are lighter than most carriers and UPSable so the hassle of going to the airport with a bicycle can be avoided all together. For bicycle dealers, Crate works features a new, expanded website that will soon allow dealers to order directly online, plus net 15 terms after the first sale. In addition, Crate works can drop ship directly to bike shops or consumers, and can ship most orders within two days of placement. 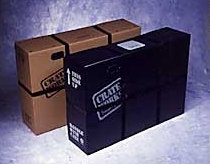 Crate works products include the PRO1, the strongest corrugated-cardboard bicycle box on the market. The PRO1 boasts Crate works rigid CORR-X Frame Plate, numerous tie downs, reinforced handholds, foam chocks and an H-Strap System for additional support. When not in use, the box is fully-collapsible for easy storage. MSRP is $109. Crate works also manufacturers the PRO XLTC for recumbent bikes and tandems, and stocks all replacement parts. For more information call 1-800-934-5214 or visit Crate works on the Internet at www.crateworks.com.